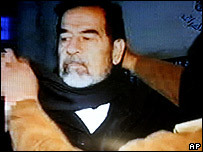 I find myself shocked and even saddened that Saddam Hussein has been executed in Iraq. How many times in Irish history did the British decide to execute our leaders, foolishly thinking it would being peace, only to find that it made things far more unstable in the long run? You don't stop killing through more killing. This tyrant should have been left to rot in a jail cell for the rest of his natural life and to think about his crimes until the day he died. We're hearing that he showed no remorse as he was about to be executed but would he have done so in his later years? Now we'll never know. It's hard to believe George W. Bush supports this kind of punishment when he claims to be a devout Christian. I must have missed the bit in the Bible where Jesus Christ advocates carrying out acts of revenge. Wasn't he all about forgiveness? Wouldn't commuting Saddam's sentence to life imprisonment have been a fair reflection of that? I would say so. Reaction seems split. The Iraqi and American authorities are pleased, with Bush claiming Saddam got a fair trial (I think not) while France, Italy, the UK and the Vatican have expressed unease at the use of the death penalty. Here in Ireland the Government stated its disapproval of capital punishment but said the right of the Iraqi judiciary to hand down a sentence had to be accepted. The Minister for Foreign Affairs, Dermot Ahern said he believed Saddam Hussein should have ended his years behind bars for his heinous crimes. Fine Gael's Foreign Affairs Spokesman, Bernard Allen TD, said the execution will deepen the already open wounds in Iraq and will inevitably lead to increased violence and bloodshed with further consequences for other parts of the Middle East. I too believe this will lead to increased violence and see it as yet another incompetent act by the American administration. As I watched the footage of Saddam being led to the gallows surrounded by men in balaclavas and as I observed the dignified way in which he met his demise, it just seemed to be too righteous a send-off for someone so repugnant. I find it a sorry indictment of humanity that we are heading into a new year - 2007 - and the main story around the world is the execution of a human being. What a way to start a new year, eh? We seem to learn nothing. Merry Christmas ladies and gents! Padraig Nally - A free man! Where are all the great Irish women?